Sonic the Hedgehog is a platform game developed in Japan by Sega and published for the Sega Mega Drive/Genesis system. It is the inaugural game and 1st installment in Sega's flagship Sonic the hedgehog video game series, and was the first title developed by Sonic Team. The game was released in 1991 in North America, Europe, and Japan. It is sometimes retrospectively referred to as Sonic the Hedgehog 1 or Sonic 1 to differentiate it from both its main character and sequels in the same series. Sonic is a blue hedgehog who lives on South Island with his animal friends. In this first chapter of an ongoing saga, Sonic encounters an evil scientist by the name of Dr. Robotnik(known as Eggman in the Japanese version of the Sonic the Hedgehog continuity) for the first time. Dr. Robotnik/Eggman seeks to obtain the powerful Chaos Emeralds for the purpose of creating Robotnik/Eggman Land, and sets about transforming animals into robots to serve his ends. Realizing Dr. Robotnik/Eggman's evil ambitions, Sonic pursues him though several of the world's "Zones" before eventually defeating him in Scrap Brain Zone. Following this victory, Sonic returns home to South Island to rejoin his friends and resume his normal life. If the player was able to collect all the Chaos Emeralds, their power produces new plant life in the Green Hill Zone, which surprises Sonic. In the game, Sonic must prevent Doctor Robotnik from collecting the six Chaos Emeralds in an attempt to rule South Island. The player controls Sonic as he traverses six zones, each of which is split into three "Acts". At the end of the third act of each zone, the player faces Dr. Robotnik in one of his vehicles. The gameplay centers around Sonic's ability to run at high speeds with levels that include springs, slopes, high falls and loop-de-loops. Hazards the player experiences include a wide variety of badniks, animals trapped inside mechanical bodies. The player must also avoid rows of sharp spikes, bottomless pits, and other obstacles. Scattered around each level map are gold rings, a signature item of the Sonic series. Collecting 100 rings rewards the player with an extra life. Rings act as a layer of protection against hazards as long as Sonic is holding at least one ring. Shields and temporary invincibility can also be collected in order to provide additional layers of protection; however, they do not prevent the player from losing a life if Sonic be crushed by a trap, be drowned, fall into a pit, or spend over ten minutes in an Act. Progression through the game is aided by lamp posts that act as checkpoints. In the Japanese version, if a checkpoint is activated and a life is lost as a result of running out of time, the time at the checkpoint will reset to 0:00. If Sonic lose all his lives, the game is over unless he obtained continues from Special Stages, in which case Sonic returns to the beginning of the Act with three lives. If Sonic reaches the end of Act 1 or Act 2 of a Zone with at least 50 rings, the player can enter a Special Stage, consisting of a 360° rotating maze. Sonic bounces off the bumpers and walls of the stage like a pinball, the main goal is to obtain the Chaos Emerald at the end of the maze without touching any bumpers, which force the player out of the stage. Collecting all the emeralds allows the player to view the good end sequence. 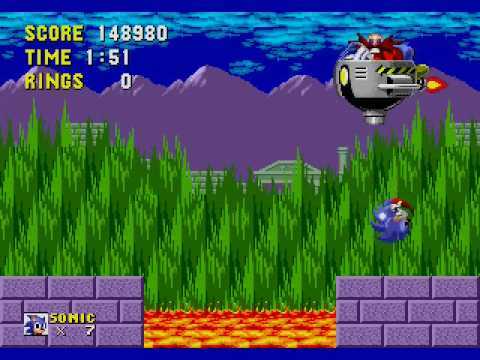 Sonic running through the first level of the game and one of the all-time classics, Green Hill Zone. Development for Sonic the Hedgehog began in April 1990, after Sega ordered its AM-8 team to develop a game featuring a mascot for the company. After choosing a hedgehog as the main character, the 5-person group changed its name to Sonic Team and started working on Sonic the Hedgehog. The main minds behind the game were character designer Naoto Ohshima, game programmer Yuji Naka and designer Hirokazu Yasuhara. The game was originally intended to feature a sound test menu, with animated graphics based around Sonic break-dancing to the music of a "Sonic Band" consisting of Sharps Chicken (guitar), Max Monkey, (guitar), Mach Rabbit (drums), and Vector the Crocodile (keyboard/synth); Vector was later re-designed and re-used for the games Knuckles' Chaotix and Sonic Heroes. The development schedule meant that the feature had to be scrapped, and Yuji Naka decided to replace the test with the "Sega!" chant used in TV advertisements, which allegedly took up 1/8 of the 4-megabit cartridge. Sonic the Hedgehog uses the on-board Yamaha YM2612 synthesizer sound chip to produce a variety of stereo sound effects and music. The game has been praised for its dynamic music, composed by Masato Nakamura, a member of the popular J-pop band, Dreams Come True. Akira Watanabe, the illustrator of the character art, said that his sole goal was to depict the characters as "colorful" and to use clear cutting lines and gradation to "finish them neatly." Watanabe said that the developers asked him to create a package design "similar to pop art." Watanabe aimed to create the design "without being particular to conventional packages." Watanabe intended to create an "original, stylish pop game package." Image of Sonic fighting off Dr. Robotnik. The first version, released in North America and Europe, lacked some graphical enhancements that were added to the Japanese release a month later, such as clouds that moved independently of the scrolling background in Green Hill Zone, two water graphical effects in Labyrinth Zone, and more parallax scrolling in all backgrounds of the levels. Years later a revised version became available in Sonic Mega Collection. This version contains all of the graphical enhancements and also fixed a bug in which Sonic would instantly die if he "bounced" from one set of spikes to another due to him not gaining temporary invincibility until his feet touched the ground. The Japanese version wasn't released in North America and Europe until Sonic Compilation. Sonic Jam contains the two versions released in the Mega Drive's lifespan while Sonic's Ultimate Genesis Collection uses the earlier Japanese version. In addition to this, due to differences between standard PAL and NTSC refresh rates (50 Hz and 60 Hz respectively), the European version of the game plays at about 83% speed of the NTSC version. and the music is also slowed down by the same amount. Subsequent PAL Mega Drive games and some of Sonic 1's re-releases (e.g. Sonic Jam) retained the NTSC versions' correct music speed, although the gameplay remained slower. Image of the 16-bit version. Sonic the Hedgehog is a video game that was released for the Sega Master System and the Game Gear. Though based on the Mega Drive game of the same name, it is a distinct game, with different level designs, and three of the six zones (worlds) based on original themes. The game's manual also gives it a different story, set after the Mega Drive version. The Sega Master System version was the final title for the console released in the United States and is now on the Wii Virtual Console, released in North America on August 4, 2008 and in Europe on September 19, 2008. The Game Gear version has appeared with other titles on Sonic Adventure DX for Nintendo GameCube and PC and Sonic Mega Collection Plus for PlayStation 2, Xbox, and PC. A conversion for Palm Tungsten handhelds was also released in 2003 by Sega Mobile. A look at the 8-bit version. A new version of the game, which was entitled Sonic the Hedgehog Genesis, was released for the Game Boy Advance in November 2006 as part of the celebrations of the original game's 15th anniversary. The game is a remake of the original game as opposed to a port. It includes a new save feature and a special "Anniversary Mode" featuring the Spin-Dash move that was added in later games. In addition, the view is slightly zoomed in and adapted for the GBA's widescreen aspect ratio, and the level select and debug codes have been left out, the former because there is already a zone select screen. The reception was negative, as many reviewers criticized the game for its slow frame rate, music, and glitches—most called the game "unplayable." 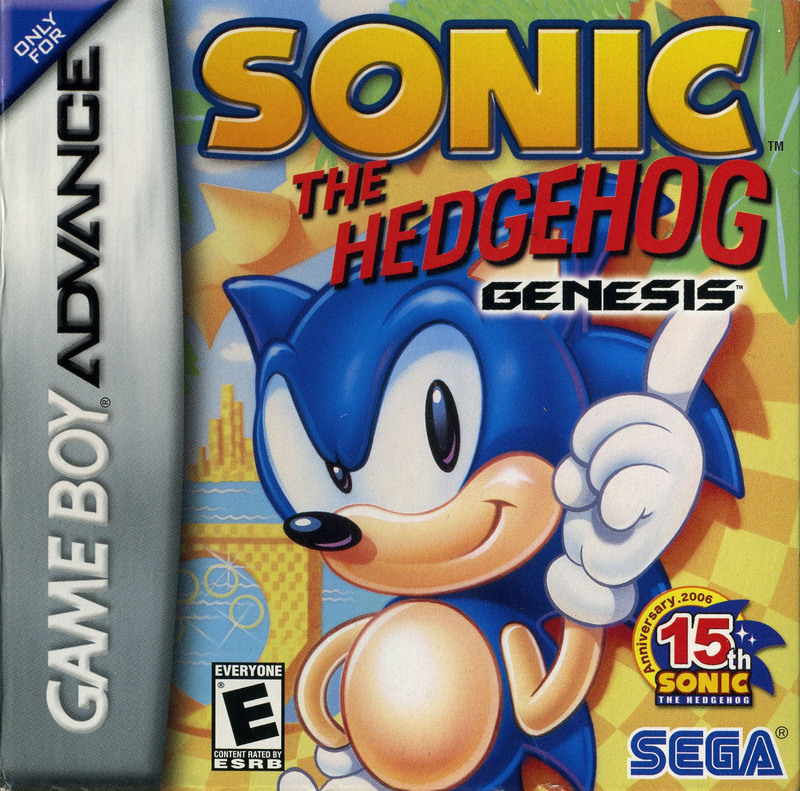 Cover of Sonic the Hedgehog Genesis for the Game Boy Advance. The Sega Genesis version of the game was reviewed in 1991 in Dragon #174 by Hartley, Patricia, and Kirk Lesser in "The Role of Computers" column. The reviewers gave the game 5 out of 5 stars. The game was both a critical and commercial success. The game was eventually bundled with the SEGA Genesis and had sold 15 million copies. Bundling Sonic the Hedgehog with the Genesis is credited with helping SEGA gain 65% of the market share against Nintendo. The good ending of the game when Sonic collects all of the Chaos Emeralds. Sonic the Hedgehog greatly increased the popularity of the Genesis in North America. After it was released, it eventually replaced Altered Beast as the game bundled with the console. In large part due to the popularity of this game, the Genesis outsold the Super Nintendo nearly 2 to 1 during the 1991 holiday season. This success led to Sega overtaking Nintendo in January 1992 with control of 65% of the 16-bit console market, making it the first time Nintendo was not the console leader since December 1985. The game featured many novel elements which contributed to its popularity and helped to promote the uptake of 16-bit consoles. The game is widely considered to be one of the greatest games of all time, placing #63 on IGN's 2007 list. Sonic the Hedgehog added the element of speed to the standard platform formula and introduced other unique elements as well, such as the loops, springboards, high-speed devices, and the rings now permanently associated with the series. While the speed greatly contributed to the mix, the excellent execution of the platforming element was what made the 2D games shine. The game spawned numerous sequels. While the first games in the series were platform games, the series has expanded into other genres such as action-adventure, fighting, racing, role-playing, and sports. The series has also expanded into other media, including anime, cartoons, comic books, manga, and toys. This game was of course what got me into Sonic. The game that started it all is no doubt a classic. Feel free to discuss about the game, Sonic the Hedgehog here. FINALLY somebody decides to comment on the first Sonic game ever made. Tsk tsk tsk, shame (Joking). I don't own the original but I played it on my aunt's Genesis back when Sonic was new. And thus, I became a Sonic fan. Sonic 2 was the only Genesis game I remember playing. My sisters played on the Genesis too, so I'll ask them if we ever had any other games. Probably did, but I guess they just didn't play it as often. Uh huh. If I had the Mega Collection I'd be playing Sonic 3 & Knuckles all the time. Wo knows, might get it eventually. There's always Sonic Classic Collection for the DS. It includes, if memory serves me correctly, Sonic 1-3&K, and some other games. But I really do want to feel the nostalgia, playing on the Genesis like I used to. :/ Playing it on the DS just wouldn't be the same. Then maybe you could try to get another one via Internet. Mega Collection has all the Classic games on it. Don't forget Mega Collection Plus! Indeed, can't forget that either. Well I'll be looking for the missing wire for the Genesis, and hopefully find it along with the other Sonic games I'm missing. I used to play on my Genesis, until it took an arrow to the knee broke. Rhys the Porcupine wrote: Good luck on that. Thanks! I'll definitely keep looking. Daniel the Alicorn wrote: I used to play on my Genesis, until it took an arrow to the knee broke. Aw no way! D: Are you getting a new one?